Di rerun election for Benue State north central Nigeria dey go jejely for di state except for two local goment; Ukum and Kwande wia jaguda pipo try cause kata-kata. Di INEC oga kpata-kpata for Benue, Nentawe Yilwatda tell BBC Pidgin say afta dem deploy election material finish for polling unit for Ukum local goment, some jaguda pipo come dey shoot for up. E say anoda incident happun for Kwande Local goment area and wen di jaguda pipo cari di electoral material, na so military pipo land come collect di election material from dem but dem no fit collect di voter register. 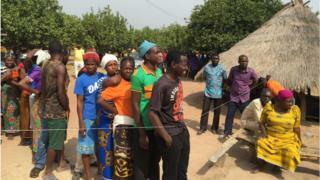 E explain give say except for this incidents, Di election for di state di go well.